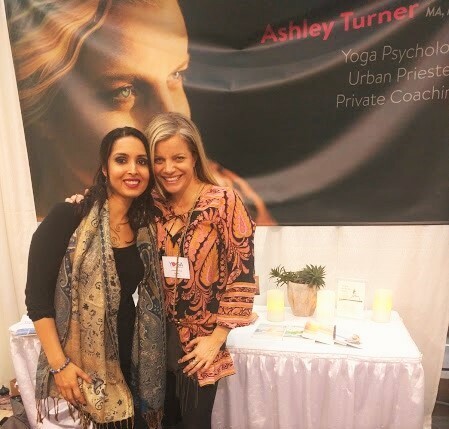 I recently had the pleasure of attending acclaimed yoga teacher, psychotherapist and ordained priestess, Ashley Turner’s amazing Urban Priestess Training class at the Toronto Yoga Conference. I was excited to meet her as she too is dedicated to teaching healing from the inside out and empowering women on the Goddess path. I also had no idea what to expect from this beautiful and charismatic “celebrity” in my field. At her class, I was completely taken by how warm, grounded and loving she was. She was so present with every student, so in tune with our group’s energy and so responsive to our needs. As she channeled sacred feminine teachings and held the space for us all, it felt like she was embracing us in a tender, light-filled hug. Not surprisingly, she proceeded to share that when women work from their feminine power, we extend out from our hearts, through our arms, in a horizontal, all-compassing current that hugs and holds. This was a beautiful insight, given as our society perpetuates the masculine, vertical current that climbs and conquers. Beyond just sharing her vast wisdom, Ashley generously directed us to her peers’ offerings for more resources–speaking of them with deep love and respect and graciously helping them prosper from her referrals. I was so touched and inspired by her giving spirit that I happily offered up my Saturday to assist her at the event, where I was joined by even more lovely ladies. Like Ashley, we were all fellow yoga teachers and coaches/healers/therapists, and we joyfully did our parts to help Ashley have a smooth and successful event. Fortunately, I see such support among women leaders in my field all the time, who clearly regard each other as contemporaries rather than competitors. They interview or guest blog for each other, happily promote each other’s latest offerings, and join alliances to create mutual prosperity while serving each other’s tribes. This heart-centered collaboration, connection and community, my sisters, is the feminine cure to competition. In an age where we can’t avoid seeing the best, most curated parts of others’ lives through social media, it’s easy to get envious no matter how grateful we feel for our good. We also know, however, that what we share and see are usually the highs-not the lows-of our lives. The first thing to remember is that when we see someone else thriving, we have no idea of the journey behind their success, nor what other pains and struggles they may still be facing behind the scenes. The second key is to remember is that envy comes from a lack consciousness. It’s a belief that says “She has something I want that I don’t/can’t have.” This is completely false. We live in an ever expanding and endlessly abundant universe, and every single one of us is equally worthy of infinite good. As a practice, if you find yourself feeling envious, ask yourself where within do you feel that this good is not available to you? Remind yourself that if it is possible for another, it is possible for you. Once you know that you are just as worthy, loved and supported by the Universe, you will find yourself getting inspired by others’ success, and take joyful action to create your own. Instead of seeing those in your field as competitors and feeling better or worse off through comparison, see them as your colleagues and comrades. Rest in the knowing that there is more than enough abundance for us all, and that what is yours cannot be withheld from you. The same loving source that provides for others surely provides for you. And while you may have similar qualifications, services or goals, what you are here to share is what only you can share—no person can do what you do the way that you do it. Therein lies your gift to the world, and your compensation for sharing it. Knowing this, take a leap, lean in, and collaborate with your beloved colleagues. Look for ways that your talents, offerings and platforms can complement each others’. Refer and promote each other. Join forces and create alliances to serve and shine in ways you couldn’t on your own. And then open to all the blessings and success that will inevitably unfold for everyone. One of the most damaging shadows of the feminine is relational aggression. While men may be inclined to express their hostility through physical or verbal aggression, we tend to do it through gossip, cutting off and casting out. In doing so, we tear each other down instead of building each other up. When we bring down a sister through such unloving acts, what we are actually doing is revealing our own insecurities and weakening our collective feminine power. The Goddess within is beckoning us to abandon these destructive old ways and elevate each other instead. Where do we start? With ourselves, of course. We start by reconnecting with our own inner Lakshmi—the divine source of abundance, love and light within—so that we can meet each other from a place of inner security, fullness and grace. As we embody our own divinity, we radiate it out into blessing. We remember that through love, service and celebration, good is never divided but ever multiplied. Resting in this, we share. We connect. We support. Like me and my fellow yogini sisters coming together to promote Ashley’s offerings, we serve and nurture. And as Ashley gave us in return, we are held and hugged. Join me, my sisters, in coming together through inspiration, collaboration and connection, so that we can love and embrace instead of cut off and compete. Because a hug nourishes. And what we nourish, flourishes.